Living Room Additions | Sarnia | Carosyl Home Additions Inc.
What would a home be without a living room? The living room is a great place to entertain guests, relax with family, and unwind after a long day’s work. All in all, this room wears many hats, and it is arguably the most important space in your home. Is your living room everything it can be? If you don’t have adequate space to let loose, you may want to consider a living room addition. Just think about how an additional room can enhance your quality of life! More family time! Additional breathing room! Increased comfort! If you are considering a living room addition for your Sarnia home, you’ve come to the right place. As a leader in home addition construction, we at Carosyl Home Additions Inc. can give you and your family the additional living space you need! While we offer a wide range of home improvement services, we love working with homeowners when it comes to living rooms because we know what an important role this room will play in their lives. From casual sitting areas to entertainment rooms, our goal is to take your ideas and translate them into space that makes sense. As the old saying goes, your home is your castle, and when you team up with us you will be feeling like royalty in your new living room. What are your living room ideas? Living rooms are for living, and your family lives differently than any other family. Shouldn’t your living room be unique too? Whatever is on your long list of must-haves, you can count on us to see it through. When it comes to construction, we want the end-result to be just as you imagined! 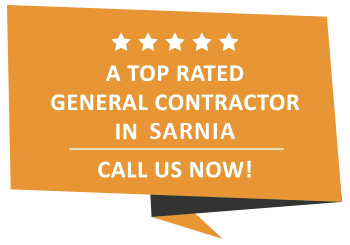 As a leading general contracting company in Sarnia, we feel confident that we can meet your needs. Give us a call today to start planning your living room project! We are looking forward to hearing from you!